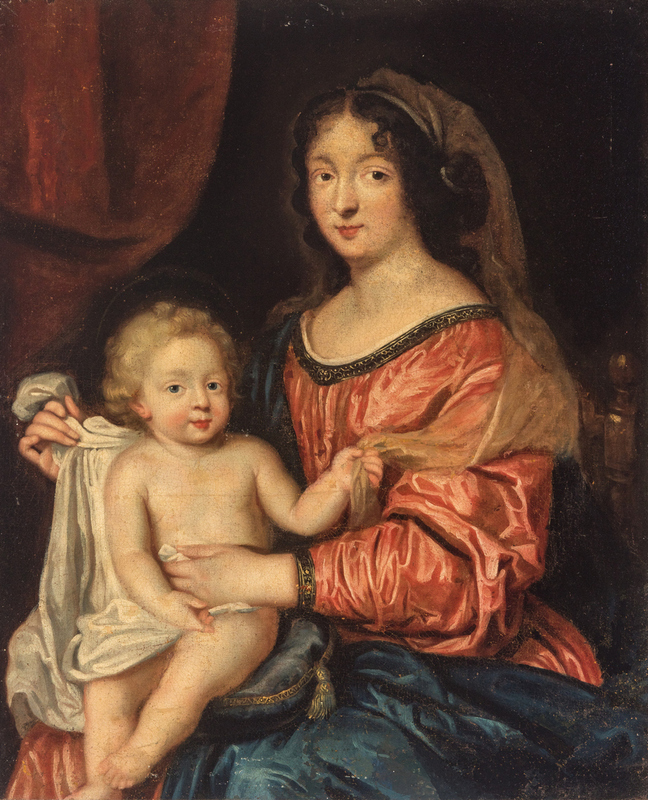 Manner of Sir Peter Lely (Pieter Van der Faes, German/English, 1618-1680) oil on canvas portrait painting titled "Madonna and Child" depicting a golden-haired and partially-draped infant with halo above his head, seated on a cushion in the lap of a dark haired woman with rose colored silk gown having ornate beaded trim, blue mantle, and partial head covering. 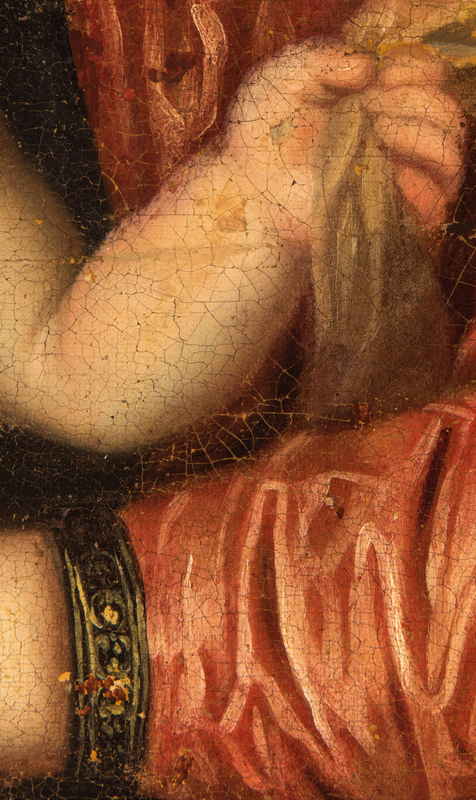 Both figures have serene expressions. 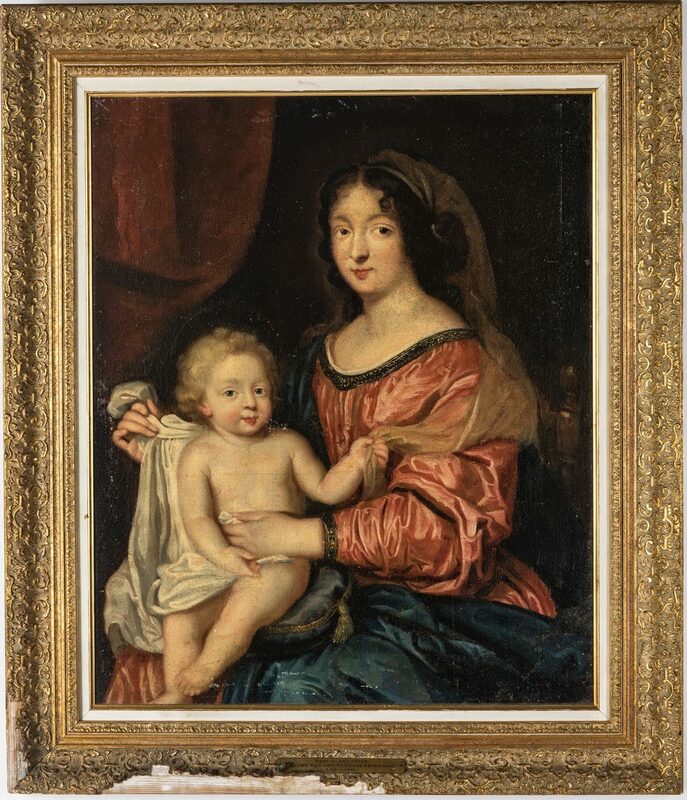 Housed in a later giltwood and composition frame with placard reading "Madonna and Child / Pieter Van Der Faes, Sir Peter Lely 1616-1680". 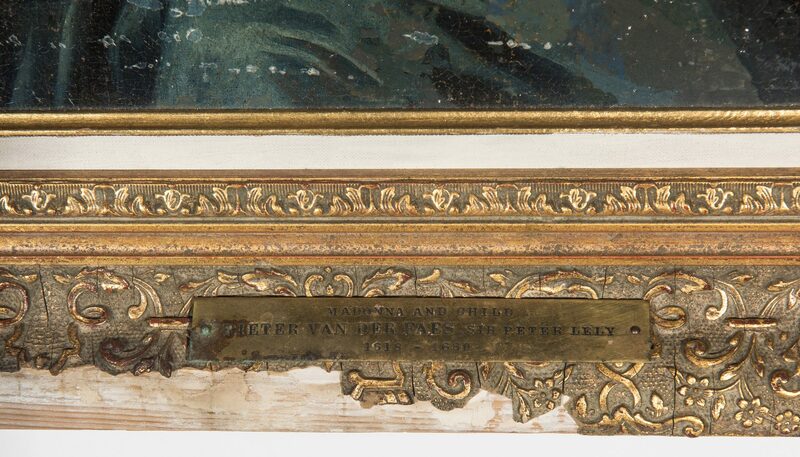 Remnant of French newspaper en verso of stretcher. Sight – 25" H x 20 1/4" W. Framed – 32 1/2" H x 28" W. Provenance: Discovered in a Clarksville, TN estate. 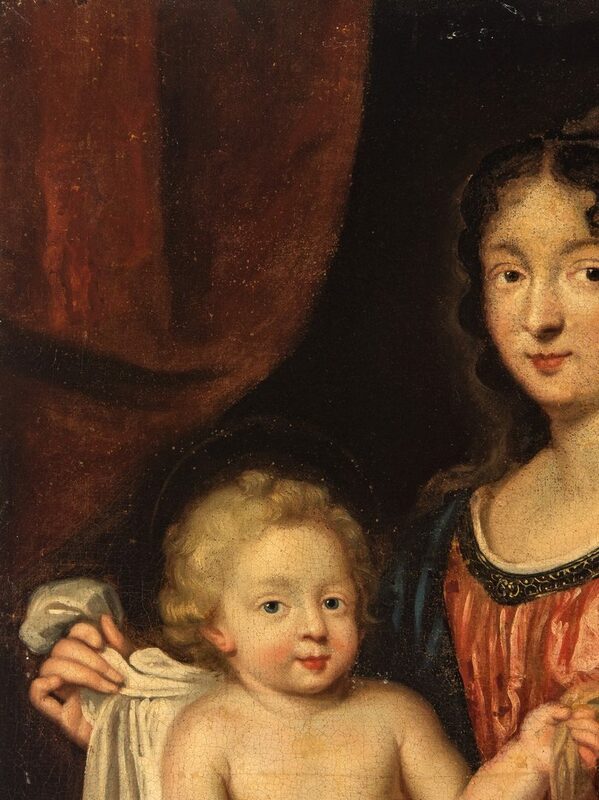 Biography: Born in Germany to Dutch parents, by 1637 [the artist] was known as Pieter Lely at the Guild of Saint Luke in Haarlem, where he trained. Ten years later he was in London, where he painted landscapes, religious scenes, and history pictures but quickly recognized the strength of the market in portraiture. 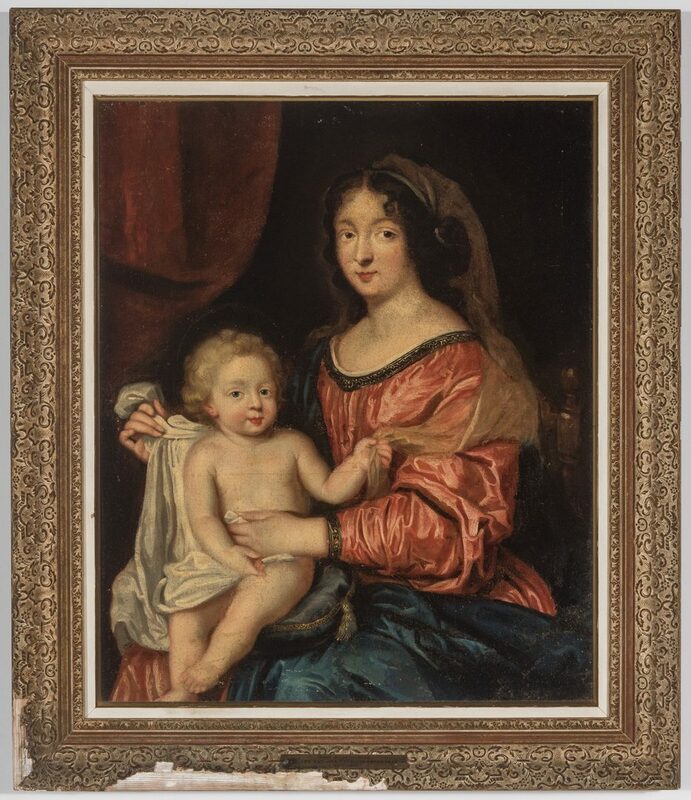 He incorporated van Dyck's sense of scale, shimmering handling of paint, and repertoire of design and accessories with his own impeccable drawing and Dutch qualities of rich color, dramatic lighting, and romantic landscape. In 1661 Lely became the Principal Painter of the restored English monarchy; he succeeded in capturing the court's sensuous languor and also assembled one of England's finest art collections. 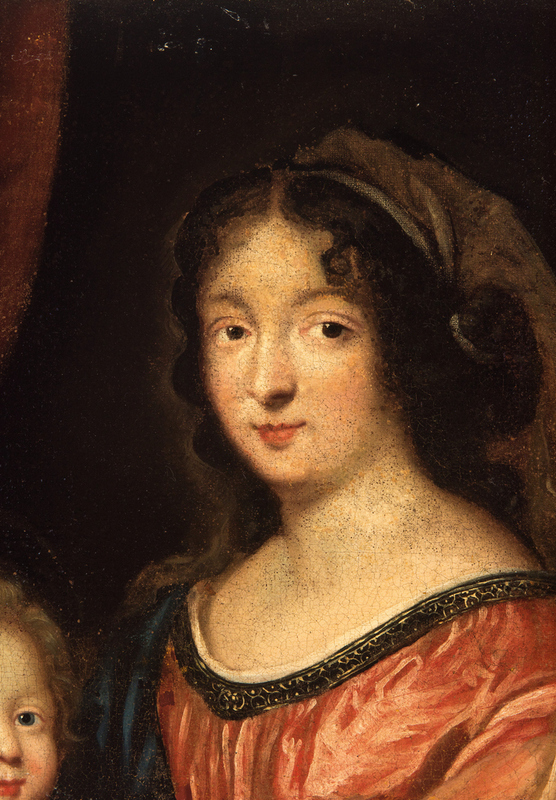 For years Lely had no serious rivals, and he was enormously influential. 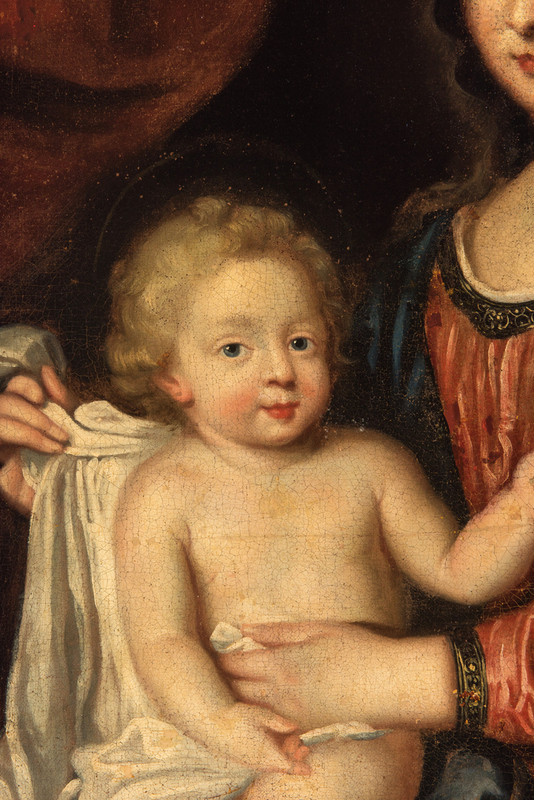 Demand was overwhelming, and his studio was a well-oiled machine; by 1670 he had numbered his poses. 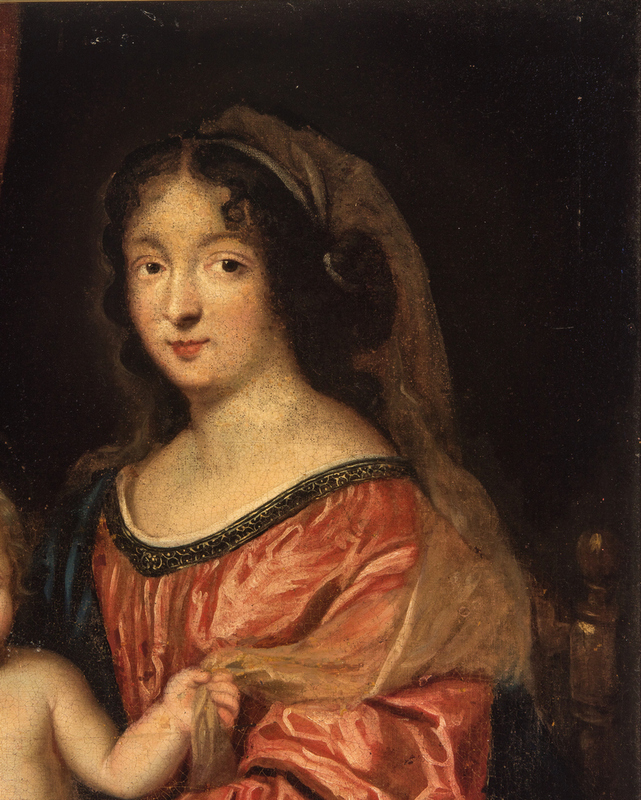 After painting the sitter's head from life, Lely's contribution ranged from completing the entire portrait to simply handing it over to assistants. 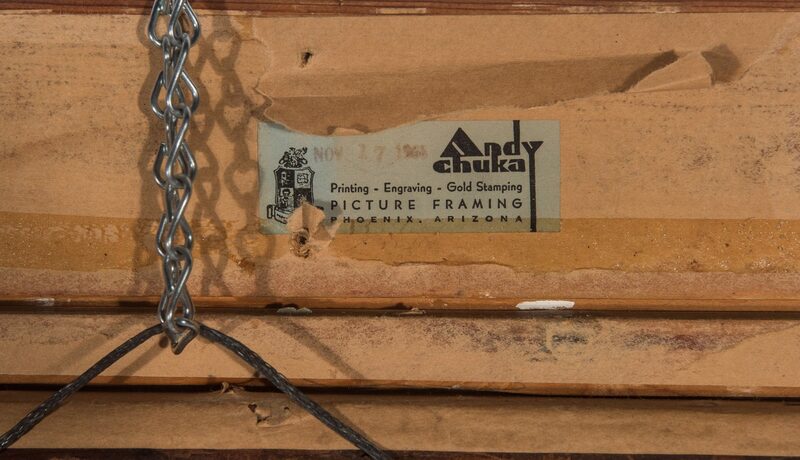 (source: the J. Paul Getty Museum). 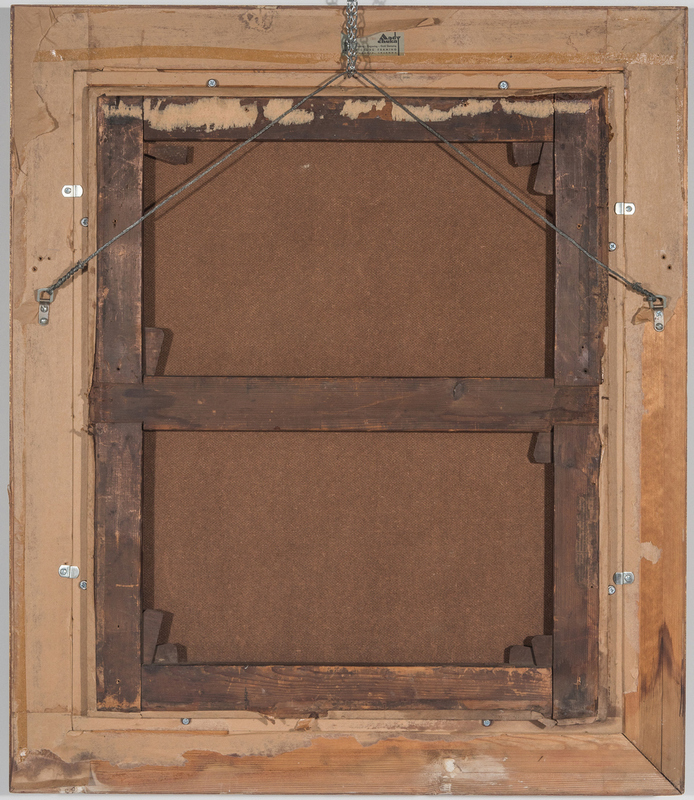 CONDITION: Canvas laid down on artist board. Areas of white accretion around infant's mouth as well as top center, bottom center, and upper lefthand corner. 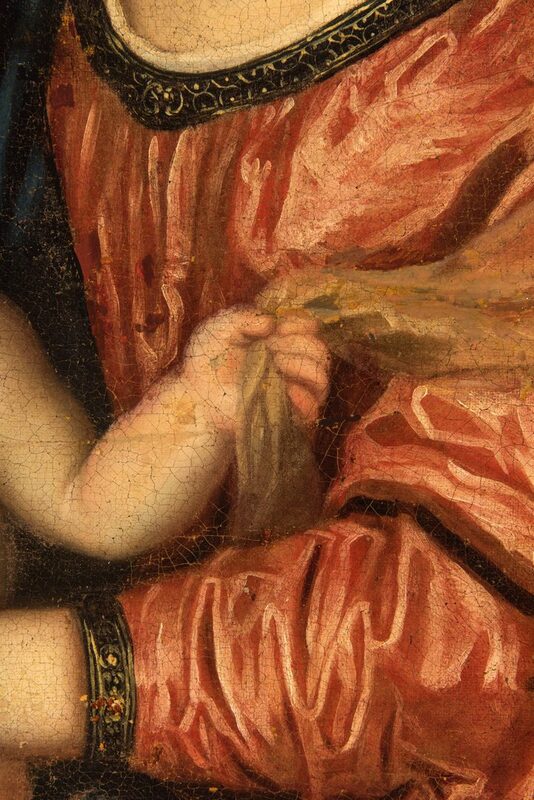 Moderate dust on canvas surface. Moderate craquelure overall. 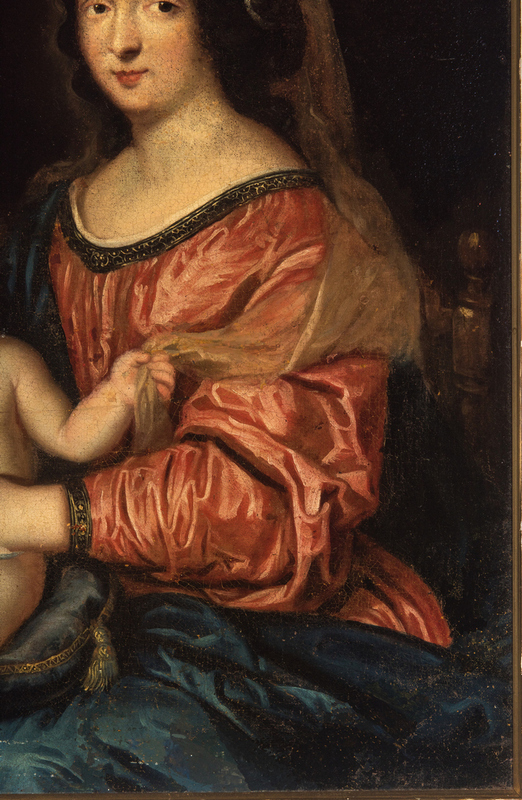 Black light reveals scattered inpainting to dress bodice; right of Madonna's face, and infant's ear; also along top. 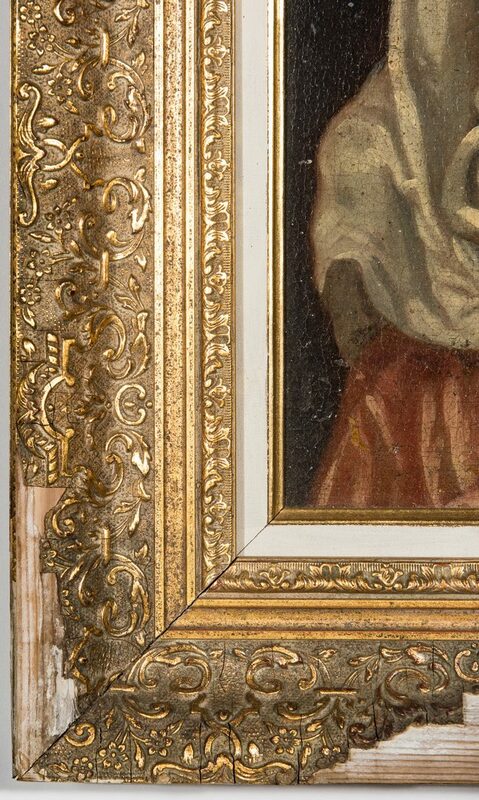 Significant losses to molded gilt frame along the bottom.